CE member Codiqa will surpass 10,000 registered users this week, despite being rejected from Y Combinator last fall. Codiqa builds drag-and-drop jQuery Mobile prototyping tools and allows users to share working mobile app prototypes with a team. One month ago Codiqa left private beta and launched an embedded version directly on the jQuery Mobile homepage, which helps contribute to over 400 new developers from all over the world signing up to use the service each day. Read more about their growth here. 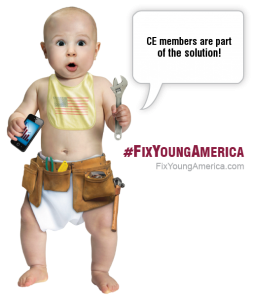 Capital Entrepreneurs has recently partnered with the Young Entrepreneur Council (YEC) to promote their #FixYoungAmerica campaign to address a single, nagging question in the U.S.: How do we overcome the twin epidemics of youth unemployment and underemployment? With youth unemployment at a 60-year high and student-loan debt nearing the $1 trillion mark, can anything be done by the technology sector to help young Americans struggling to find work? A big part of the solution is young entrepreneurs – something that many Capital Entrepreneurs members can identify with. Capital Entrepreneurs is here to support the young entrepreneurs in Madison looking to change (and help fix) the world. Our members are creating companies, jobs, and new revenue streams. In the last year, Capital Entrepreneurs companies created 121 full time jobs and 66 part time jobs in Madison. #FixYoungAmerica is also asking supporters to help fund the movement via a crowdfunding effort on IndieGoGo. The campaign doesn’t want to try to solve youth employment by throwing money at the problem. Instead, it’s looking for “actual solutions” and to serve as the “beginning of a conversation” about the economic conditions facing American youth â€” and how to fix them. They also partnered with the Young Invincibles who are kicking off a nationwide bus tour to promote #FixYoungAmerica and their State of Young America report. The Young Invincibles bus tour kicks off from Madison on Wednesday, March 14th at 12:30pm from the Memorial Union on the UW campus. Multiple Capital Entrepreneurs members were recently named to the InBusiness 40 Under 40 list, as well as the Wisconsin Alumni Association’s Forward Under 40 list for 2012. 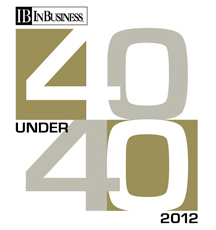 Forrest Woolworth of mobile and social gaming startup PerBlue was the youngest person named to the 2012 InBusiness 40 Under 40 class. He is an original team member and current Brand Director of PerBlue, and is a Co-Founder and primary organizer of Capital Entrepreneurs. He joins Capital Entrepreneurs members Scott Kohl, Scott Resnick, Justin Beck, Dale Beerman, Sukara Sterling, and Nathan Lustig who were named to previous InBusiness Top 40 Under 40 classes. Scott Resnick and Jon Hardin of web and mobile developer Hardin Design and Development were named to the 2012 UW Alumni Association’s Forward Under 40 list. The Forward Under 40 is a short list of top UW alumni that exemplify the Wisconsin Idea. Hardin serves as President and CEO, and Resnick serves as VP of Hardin Design and Development, and both are founding members of Capital Entrepreneurs.